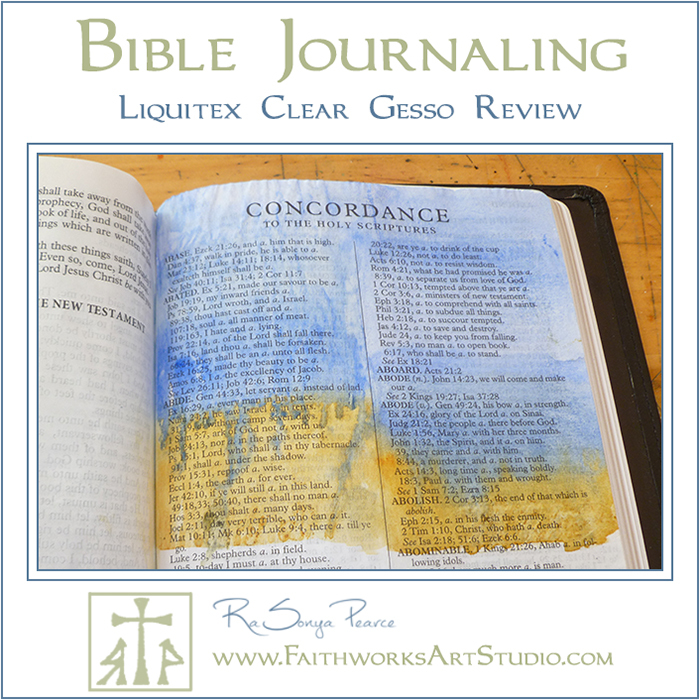 Are you confused about using clear gesso for your Bible journaling? Join the club! 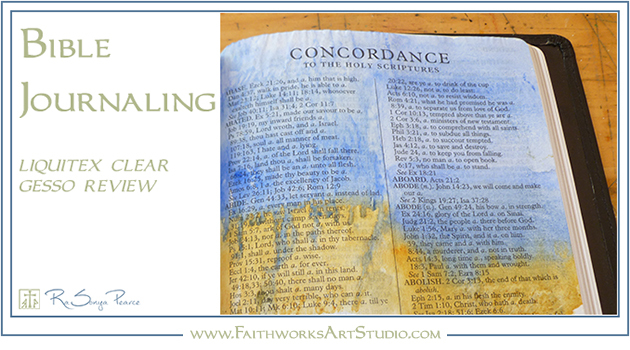 The subject of clear gesso and how to use it in a Bible for Bible or faith journaling comes up a LOT. 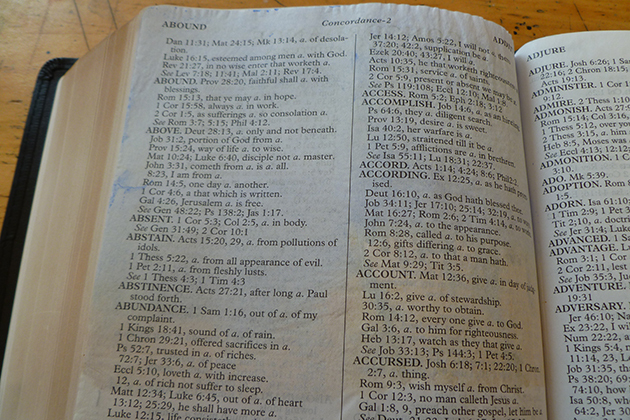 To help clear up the confusion I am going to share with you my experiment using Liquitex Clear Gesso in my Bible. First, why do I want to use clear gesso for my Bible journaling? What is it going to do for me? Gesso is used as a primer to prepare a surface before painting or drawing on it. 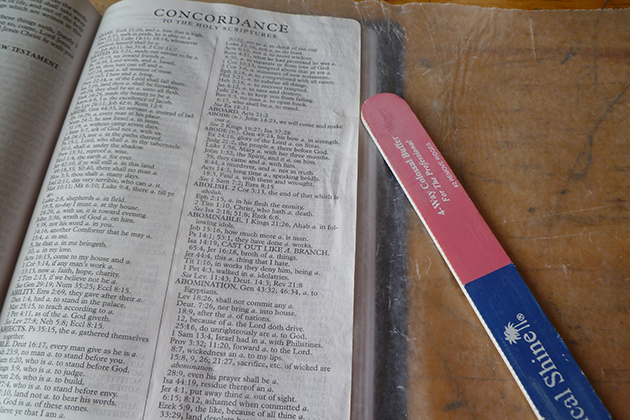 Gesso gives thin pages more heft and makes them feel a bit thicker and stronger- a nice plus when you are working with thin Bible pages. Gesso adds texture and ‘tooth’ to a surface. That means it will help paints, colored pencils, etc. stick to the slick Bible pages better. Gesso allows for a smoother application of your chosen media. 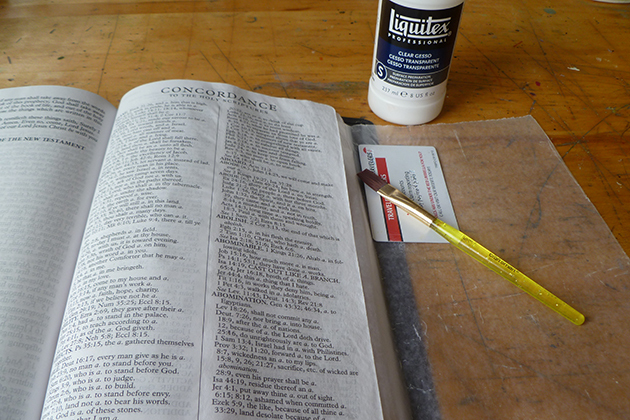 Finally, gesso can decrease the ghosting and bleed through common to thin pages- a big plus for Bible journaling. Prima Marketing Art Basics Clear Gesso – Everyone raves about this product. 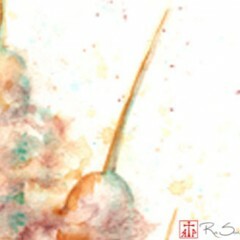 It was designed for art journaling and is acid free and not as gritty or ‘toothy’ as other clear gessos. Unfortunately, it is currently out of stock everywhere. I placed an order for it through Amazon and weeks later their system cancelled it due to the seller not shipping. I’ve emailed Prima regarding future availability of the product but have yet to receive a response. Cheap Joe’s Really Good Clear Gesso – On my to buy and try list. Cheap Joe’s website states it is acid free. Robert Burridge reviews it as having a “smooth, satin feel when dried.” Also, that it dries clear. Winsor and Newton Clear Gesso – The reviews on this state that it is very fluid, goes on transparent, but has more grit or tooth than the Art Basics. Liquitex Clear Gesso – Easy to purchase, available at local Hobby Lobby, Michael’s. Similiar to Winsor Newton Clear Gesso. Fluid, transparent but gets a little ‘milky’ with multiple coats, gritty and toothy. How do I apply and use clear gesso? Because it was easily available, I purchased and did a test run in my Bible (an Executive Midsize Notetaker) with the Liquitex Clear Gesso. I applied the Liquitex Clear Gesso to the right column with a cheap brush (don’t use a good brush for this, and always protect the page below with wax paper or heavy paper). I scraped off the excess with a plastic card. The gesso caused the page to ripple some but not terribly. The gesso left the page feeling very rough, almost like fine sandpaper. I used a four-way nail buffer to sand it smoother. Unfortunately, I ripped the page doing this. Lesson learned- go slowly in small sections, hold the edge of the page down with your fingers and buff gently between them to avoid lifting and ripping the edge of the page. To test the difference between how the left (untreated) column and right (gessoed) column reacted to watercolor I used Daniel Smith Ultramarine Blue and Quinacridone Gold watercolor. The watercolor behaved fairly normal on the right column that was treated with Liquitex Clear Gesso. The watercolor paints flowed smoothly, blended well, showed granulation typical of the Ultramarine Blue, and had some rippling. On the left (untreated) side the paints sat on the surface of the page beading up. The paints did not blend into each other very well and the paper rippled badly. On the plus side, it was very easy to lift of the watercolor that I accidently got on the facing, non-gessoed page. 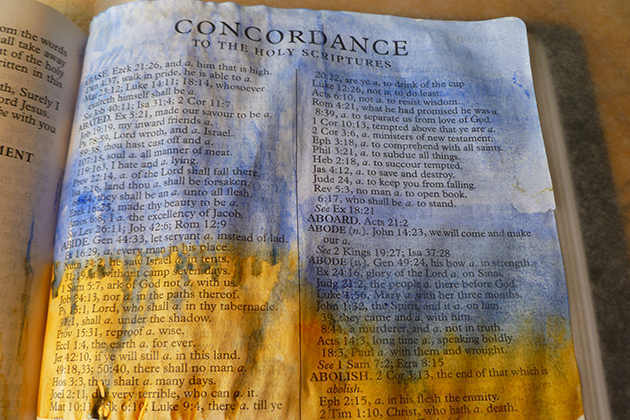 After the watercolor paints had dried, I folded my wax paper sheet over the painted page and placed my Bible under a stack of books overnight. The overnight pressing flattened out almost all the ripples in the right (gessoed) column. The left (untreated) column was smoother than before pressing but nowhere near as flat as the gessoed side. It is hard to see here, but neither side had any bleed through. However; the untreated side, now the right column in this picture, had slightly more ghosting. 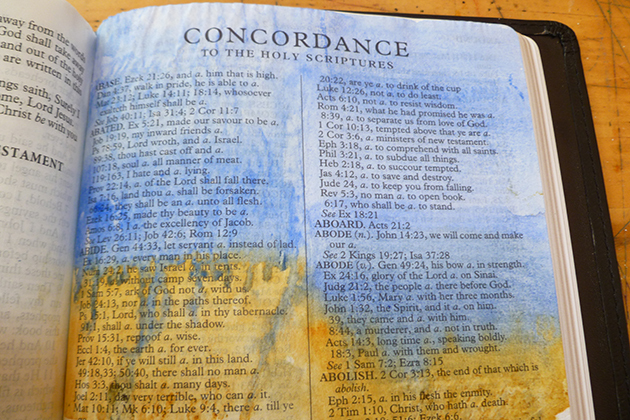 So, will I be using clear gesso when I do Bible journaling? Yes. The benefits with watercolor definitely outweigh the hassle of prepping pages with clear gesso. Will I continue using Liquitex Clear Gesso for my pages? Only until I can get something with less grit. I am not overly fond of the sand paper feel of the unbuffed gesso and I will most definitely not use the Liquitex Clear Gesso without buffing it smoother first. I hope this answers your questions about using clear gesso for Bible Journaling. Great article! Sure wish I had found it before I bought the Liquitex. That stuff is not cheap. But it was all I could find in my town.